Higher Education Minister Jonathan Moyo, one of the architects of the Zimbabwe African National Union-Patriotic Front faction known as G40 which was pushing for the younger generation to take over the party with First Lady Grace Mugabe as the figurehead, says he is proud of former president Robert Mugabe and there will never be anyone like him. 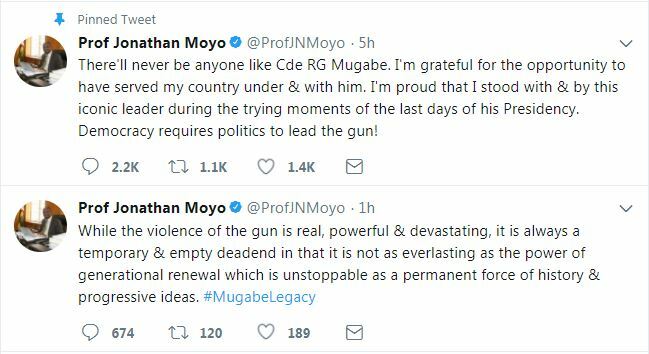 In a tweet posted after Mugabe resigned yesterday following pressure from the people and military intervention last week, Moyo who last posted on 14 November, said yesterday’s victory was temporary. “While the violence of the gun is real, powerful & devastating, it is always a temporary & empty deadend in that it is not as everlasting as the power of generational renewal which is unstoppable as a permanent force of history & progressive ideas,” he tweeted. Moyo last tweeted on 14 November just before the military took over and joked about Zimbabwe Defence Forces chief Constantino Chiwenga’s statement warning that the military would intervene if the stability of the country was threatened saying “kungovukura vukura”. He is also reported to have posted a tweet that he had skipped the country and was safe contrary to reports that he was arrested by the military which was after “criminals” that had surrounded Mugabe. “In these difficult & trying times that have been thrust upon our country, I wish to advise concerned family & friends that I’m relatively fine outside the country as are ministers Kasukuwere, Zhuwao, Hlongwane, Zhanda plus at least 50 others who include MPs & Zanu PF officials!” Moyo said. The tweet was removed shortly thereafter but the tweet about being proud of Mugabe is still on his timeline. Although Moyo has tweeted only three times since 14 November, his twitter handle has gained 19 000 followers.